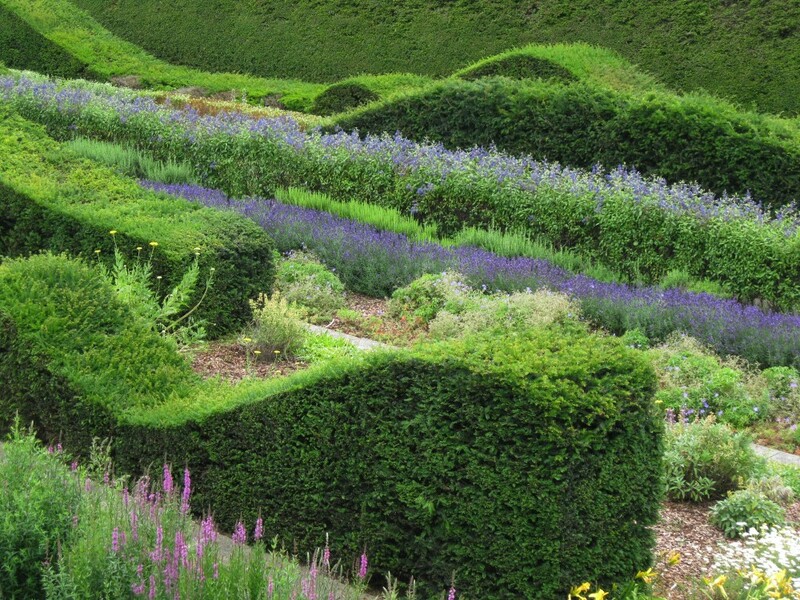 I have to admit I write about gardens I have been to several times, gardens that excite and inspire me, and ignore the numerous ones that don’t. Earlier in the year I came away from a garden feeling even more disappointed and angry than the time before, because although it is a good garden, poor maintenance has led to its decline. That garden is the Thames Barrier Park. It is sad to visit a good garden where the maintenance is not as it should be, but where parks are looked after by councils, budgets get cut, and gardens suffer. Perhaps this is a game councils play – maintain inadequately, let the garden get run-down, apply and receive a Lottery Grant, and reinstate the garden to its former glory. 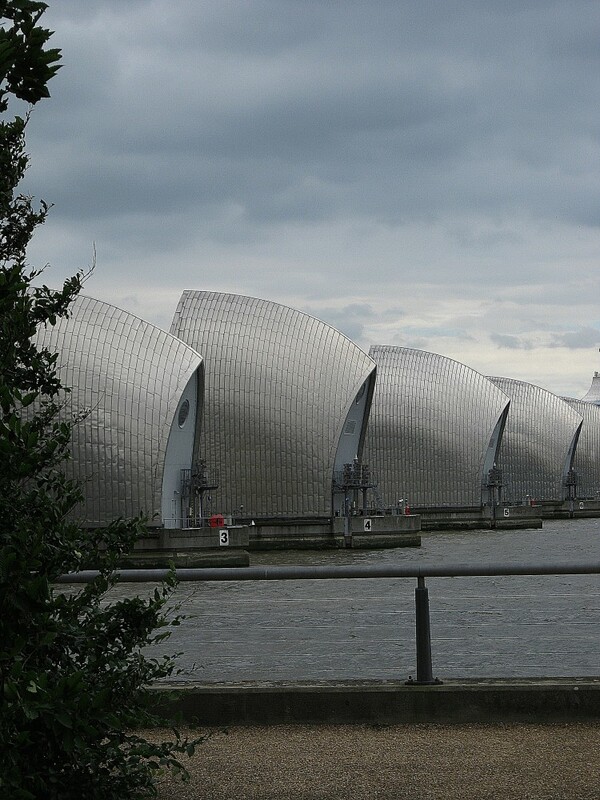 I don’t think this would be easy with the Thames Barrier Park, opened as recently as 2000. The Park is the result of a competition held in the mid 1990s, and the winning scheme was by Alain Provost of Paris-based Groupe Signes, with cafe and riverside pavilion by English architect Peter Taylor. Situated at Pontoon Dock in Silvertown, the park is built on 23 acres of contaminated land, and has many similarities to Parc Citroen in Paris, built by Provost, on the site of a former car factory. Internationally acclaimed, the Thames Barrier Park initially attracted hundreds of thousands of visitors, for its innovative design and cutting edge planting, but now it is a shadow of its former self. 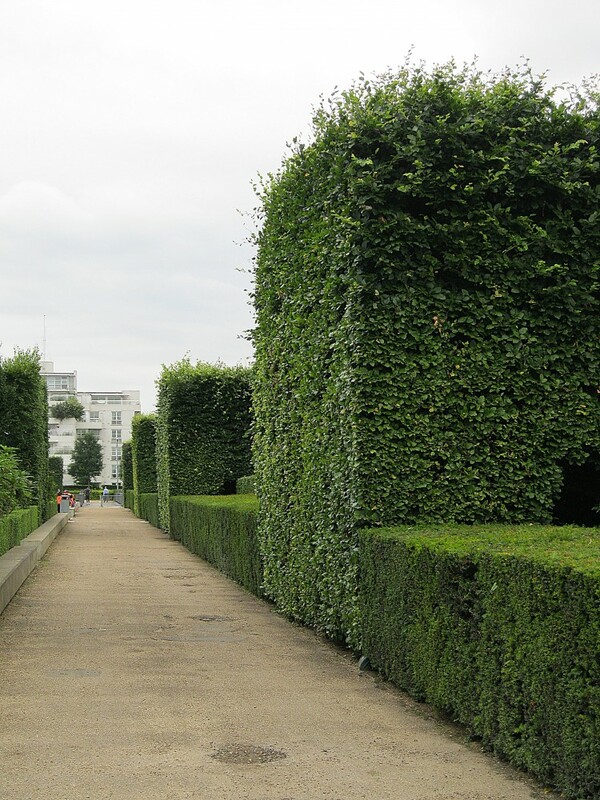 Ownership was transferred from the London Docklands Development Corporation to the Greater London Authority, and in these straitened times, the number of contract gardeners has been cut from seven to four. I have nothing against contracting out garden maintenance (the standard at the Royal Parks is impressive), but here cost seems to be the over-riding concern. 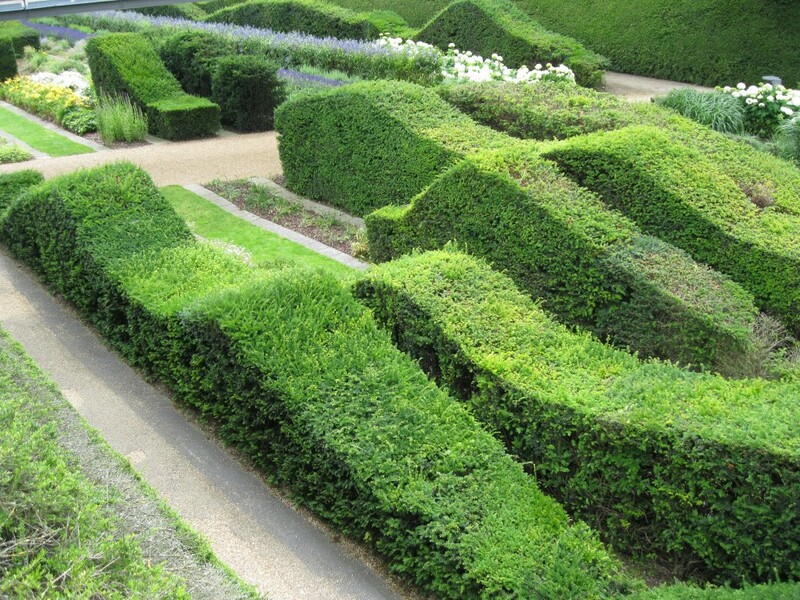 It is a deceptively high maintenance garden, with literally miles of hedges – a double run of laurel (prunus lusitanica) and yew hedges around the site boundaries, high bantered hedges and banks of lonicera, and the famous big dipper yew hedges of the Green Dock. Add to this clipped forsythia, winter jasmine, euonymous and the numerous high hornbeam cubes too high to be cut except by cherry-picker, and I can understand the gardeners’ comments about hedge-cutting being a never-ending task. The problems do not end there; the most imaginative feature is the Green Dock a long sunken garden at right angles to the river, that revives memories of the area’s dockland heritage, over-viewed from bridges and high-level walks. 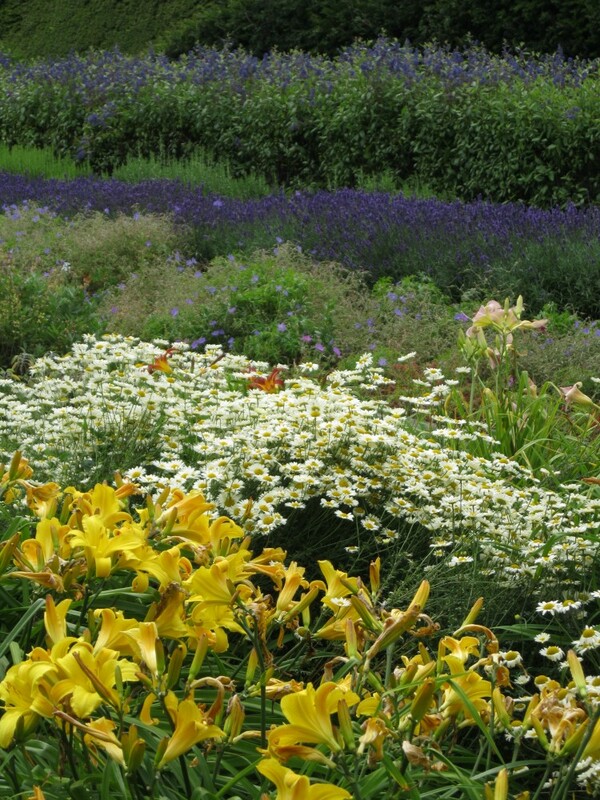 When first opened, this garden was spectacular, but the long strips of perennials are long overdue division or replanting, and in some cases have died out. This is not a fault of the design, some perennials are short-lived. Following the wet summer of 2012, the big dipper yew hedges show signs of dieback and stress, a response to waterlogged soils. At the north end of The Green Dock is the Fountain Plaza, a paved fountain court where children (and adults) are encouraged to splash around; but bottles thrown from the high-level walks to either side cause problems. Maintenance staff sweep up the broken glass, but it is easy to miss that sliver that can get into a child’s foot. In retrospect, perhaps high level walks overlooking large fountain courts is not a good idea. 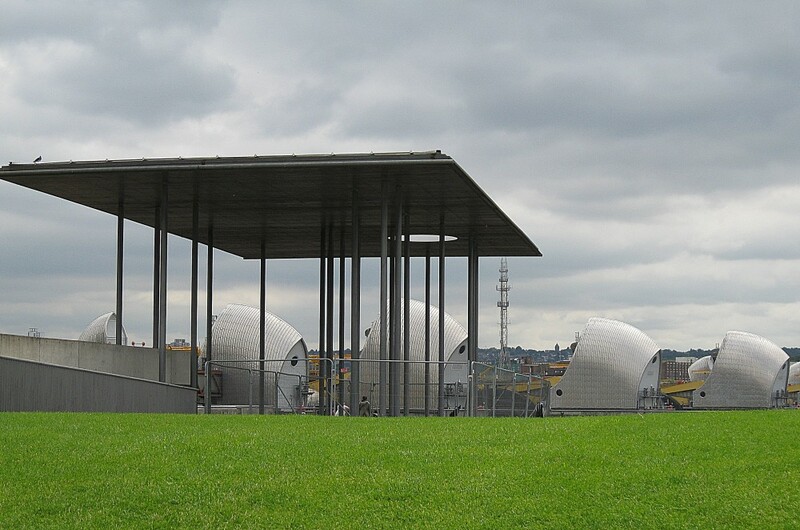 At the opposite end of The Green Dock a grass back rises up to the stylish Pavilion of Remembrance, (in memory of local people who died in the Second World War), with good views over the riverside promenade to the sculptural forms of The Thames Barrier. 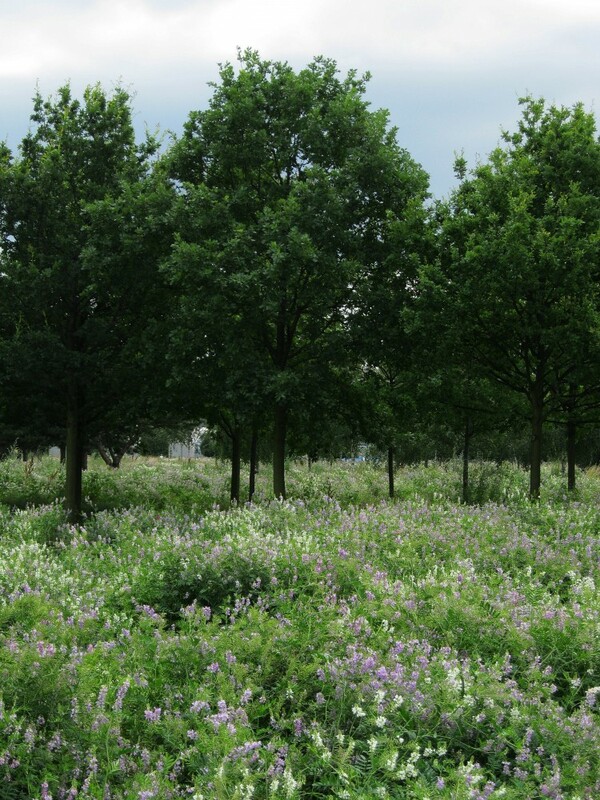 The park has a modern French feel to it – beech and birch planted in evenly spaced grids or in straight lines, and the Green Dock to be viewed as a piece of garden art, overlooked rather than used (apart from children playing hide and seek); however the large ‘meadows’ of the white, pale and deep-purple vetches looked stunning in mid-summer. More intellectual work of art, than public amenity, the inadequate maintenance undermines its raison d’etre. Sad, depressing, an almost abandoned feel to it – not my idea of what a public park should be.